Recently bees have been disappearing in their millions, affecting not only the production of native honey in every country, but most importantly, the bees' great task of pollinating the trees, fruit, vegetables and herbs that make up two-thirds of what we eat every day. In Bungay a new group has formed within Transition initiative, Sustainable Bungay, to help the threatened honey bee. Bungay Community Bees is a Beekeeping Project which aims to manage hives in as sustainable a manner as possible. It will run as a CSA (Community Supported Agriculture) scheme where members own ‘shares’ in the bees, hives and harvest, taking part in the beekeeping year. This allows members to support honey bees without being ‘hands on’ - though the group plan is to fund training and hives for up to two new beekeepers each year. In the first year Bungay Community Bees hopes to recruit at least 20 supporters to invest in two hives (National type) and colonies, insurance for two beekeepers, basic equipment and training for two new beekeepers with the Waveney Beekeepers Group. Benefits will include visits to the hives to learn more about beekeeping, an opportunity to have a hive in your garden and most exciting of all, attending a honey harvest. The share of honey and wax will increase as the hives grow in strength and number. 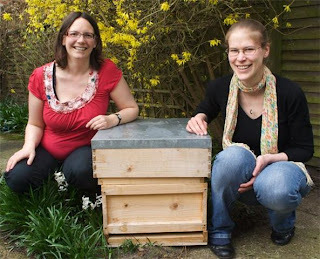 Bungay Community Bees is being organised by Elinor McDowall and Gemma Parker. Both Transition beekeepers learned their art with the Waveney Valley Beekeepers and already have two hives and fifteen members signed up for the project. In Waveney, there has been a huge increase in beekeeping interest. Last November the documentary, Vanishing of the Bees was shown to a packed audience at Geldeston Village Hall and a great cheer went up in the audience as Suffolk Beekeepers were seen marching to Parliament with their petition to help save the endangered bee. In response gardeners everywhere are starting to growing flowers for the bees in their gardens and windowsills and local and sustainably-harvested honey has become highly-sought after. But perhaps the most effective way everyone can help starts at the table. Colonies are made vulnerable to disease (especially the varroa mite), by the widespread use of pesticides and lack of bio-diversity in single-crop farming, as well as the the stressful nature of commercial beekeeping. By eating fruit and vegetables grown without chemicals on organic farms or in local allotments and gardens which support a strong diversity of wild and domestic plants we will be giving pollen and nectar to one of our greatest allies on earth. If you want to start a bee-friendly garden this summer, why not come along to Sustainable Bungay’s Give and Grow Seedling Swap on Sunday May 2 at the Bungay Library Courtyard and meet the Bungay Community Beekeepers? If you would like to join Bungay Community Bees contact info @sustainablebungay.com. Membership is £20 per annum. The Give and Grow Seedling Swap is on May 2, Bungay Library Courtyard, 11am-2pm. For more information about the project and how CSAs work contact www.sustainablebungay.com.